Tina's Crop Shop: SIP Challenge #90 - Shaker Card - Elphie Selfie Again! SIP Challenge #90 - Shaker Card - Elphie Selfie Again! Hello! I know I talk about the weather a lot but what in the world.. it was crazy this past week. It was in the high 60's most of the week and then Saturday we ended up with a little more than an inch of snow. By Sunday, it was sunny, the snow melted and it was about 50 degrees! I'm hoping that is the end of the white stuff. It's pretty but I've seen enough of it. Looking at the 5 day forecast, it looks like we'll have a few morning cold evenings but up to at least high 40's or 50's during the day. I'm so ready for Spring! Since today is Tuesday, it is of course time for another Stamp, Ink, Paper Challenge! 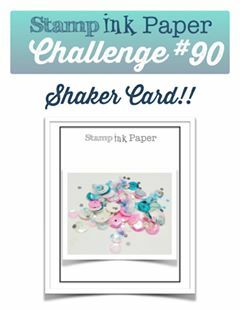 This week is a Shaker Card challenge! I love shakers so this was right up my alley! So I know I'm wearing you out on my Lawn Fawn Plaid but here I go again with the Perfectly Plaid paper stack and the adorable Elphie Selfie Stamp and Die Sets! This time I picked up on the orange in the plaid and used that for my card front. My dies for the window and the scallop card front are from Mama Elephant and are called "All Prettied Up". Hi Tina, I had to come over and find out who made the dies you've used, they are fabulous! I'll head over to ME and check them out. You can't use to much of that LF plaid for me, it's beautiful! Super cute card! Hi Tina. I love plaid it's so pretty. I still remember some plaid dresses I wore when I was a little girl, a long time ago. Love your card, and those cut events. I still haven't made a shaker. We are snowed in, so after a nap I'm going in my craft room.have a great day. Darling! Have thiis stamp set.